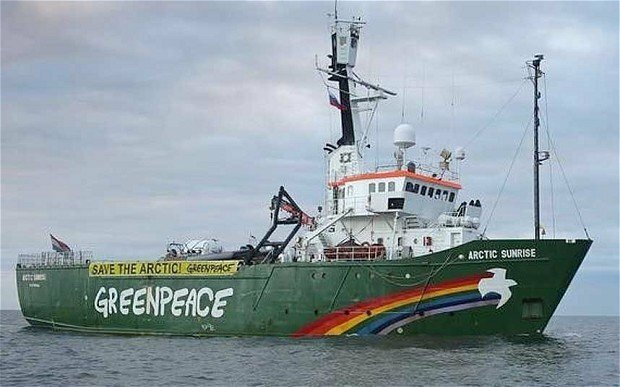 At least 30 Greenpeace activists are being held at gunpoint by Russian security officers who stormed the group’s ship in the Arctic. About 15 men in balaclavas seized the Arctic Sunrise ship in the Barents Sea, an activist said. This comes a day after four Greenpeace members tried to board a Russian oil platform to prevent it from drilling. The group says this threatens a unique and fragile environment – a claim denied by Moscow. One activist on the ship said Greenpeace members were being held in the galley of the Arctic Sunrise, while the captain was being detained on the bridge. The activist said he believed the armed men were members of Russia’s internal security service, the FSB. Greenpeace also said its vessel was boarded in international waters and called on Russian President Vladimir Putin to release the crew immediately. The ship is now expected to be taken to the Russian port of Murmansk. The Russian foreign ministry earlier accused the group of “aggressive and provocative” behavior. It said the actions of the activists who had tried to board Gazprom’s Prirazlomnaya drilling rig on Wednesday “threatened people’s lives and could lead to environmental catastrophe in the Arctic with unpredictable consequences”. Moscow also said that its coastguard vessel had to fire warning shots across the Dutch-flagged Arctic Sunrise. The Dutch ambassador to Moscow was summoned to the foreign ministry over Greenpeace’s action. A foreign ministry spokesman in The Hague later told Dutch media the issue had “our full attention” and that contacts with the Russian authorities would be pursued over what had happened. The Gazprom project is Russia’s first effort to extract oil from the Barents Sea. Prirazlomnaya is scheduled to begin production by the end of the year. Russia’s economy and its recent growth depend to a large extent on income from its huge oil and gas deposits.